The ultimate size of a fruit tree - its mature height and spread - is affected by many characteristics. Local climate, soil conditions, and the species (apple, plum, cherry and so on) all play a part. Within species some varieties naturally tend to grow more vigourously than others. Bramley's Seedling apple trees for example tend to be bigger and stronger than Rubinette apple trees. However the most significant factor in the ultimate size of your fruit tree is its rootstock. A fruit tree supplied from our nursery usually consists of two parts, the scion (the fruiting variety) which makes up most of the tree that you see above ground-level, and the rootstock which - as the name suggests - is the roots. The join or "union" is easy to spot in a young tree - it is the kink a few inches above the ground where the scion was budded or grafted on to the rootstock. This marriage works because rootstocks are very closely related to scions - thus apple rootstocks are apple varieties in their own right, but where the main attribute is not fruit flavour but tree size. Plum rootstocks can also be used for apricots and peaches, which shows just how closely these species are related. Most rootstocks will produce edible fruit if left to grow naturally, but the fruit is usually small and poorly flavoured. The rootstock not only influences the size of the tree, it also provides other characteristics such as precocity (the age of the tree when it will first start to bear fruit), some disease resistance attributes, and resistance to harsh winters. However with some exceptions, the rootstock has little influence over the size of the fruit - so an apple from a tree growing on a rootstock which limits tree height to just 2m or so is going to be roughly the same size as an apple from a tree growing on a rootstock which allows the height to be 5m or more. In other words, even if you have a very small garden and want to grow very small trees, the fruit is going to be the standard size. Whilst "seedling" trees (grafted on to roots of the same variety grown from seed) were the norm until the 20th century, the technique of grafting a fruiting variety on to a rootstock to control the size, vigour and precocity of apple trees in particular had been known for several centuries. In the late nineteenth and early twentieth centuries researchers began to formalise the use of size-controlling rootstocks for apple trees and later for other fruit tree species. Although rootstocks are invariably given cryptic numeric reference codes, they are essentially fruit tree varieties in their own right. New rootstocks are developed using the same techniques that are used for developing fruit varieties - a combination of chance, observation, and scientific crossing of varieties with desirable characteristics. The most widely-used rootstock in Europe in the 19th century was called Paradise, although there were dozens of different forms of this rootstock with a range of vigours and little standardisation. Beginning around 1912 researchers at East Malling Research Station in the UK were the first to classify rootstocks and develop new ones for specific purposes. In about 1917 they released "M IX", or "M9" as we now know it, which was derived from a form of the Paradise rootstock called "Jaune de Metz". (It is possible that "Jaune" refers to the golden yellow bark of this rootstock). Apple trees grown on M9 rootstocks are very small, and they fruit very early in life - making this an ideal rootstock for commercial apple orchards, and it is indeed probably the most widely-planted of all rootstocks. East Malling Research Station, in conjunction with some other UK research stations at Merton and Long Ashton developed a range of virus-free rootstocks of which M27, M9, M26, MM106, M7, MM111, and M25 are in widespread use today. Note that the numbers in the East Malling series have no relation to the size of the tree - M27 and M26 produce trees which are respectively smaller and larger than M9! In the USA resistance to the fireblight, and the ability to survive extreme cold are more important than they are in Europe. Work on rootstocks able to resist fireblight and cold was initially carried out at the New York Agricultural Experimental Station in Geneva, NY, and this led to the G-series rootstocks. 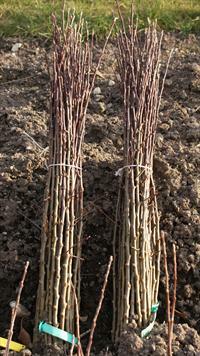 These rootstocks are often better suited to the climate and disease regime of North America than the East Malling series - although M9 and M7 are also widely used in North America. Whilst most scientific attention has focussed on developing rootstocks for apple trees, rootstocks are also important for growing pears, plums and cherries.